Anything with youth in the name you know I’m going to try it. You know we are all looking for it……youth, the fountain of youth, forever young. Well, at least trying to look younger than our age. Trying to keep the wrinkles away…..so far so good. I remember the days of wanting to look older…..what was I thinking!! Anyone else remember those days? To look old enough to get into the clubs. I always change up my skin care routine. What worked one day may not work the next so always trying new products. 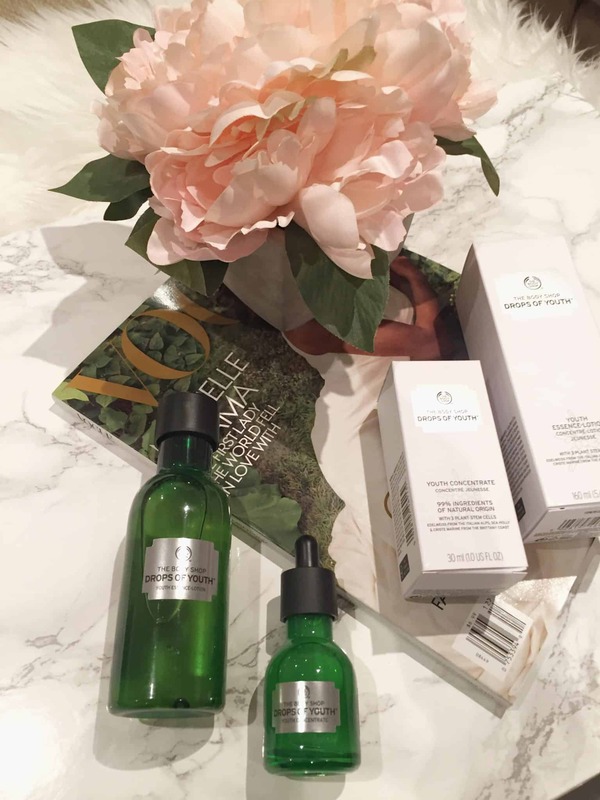 I had the opportunity to try two wonderful Body Shop products that promise more youthful skin. The Body Shop’s Drops of Youth™ Youth Essence Lotion is the essential first step after cleansing and toning to activate skin for the next steps of your youth-enhancing skin care routine. The Youth Essence Lotion works to replenish moisture and minimize pores. Skin appears smoother, visibly plumper and more luminous after use. I apply this to my face after cleansing my face and before moisturizing. I wait a few seconds to allow the essence lotion to fully absorb before applying another product. My skin looks much more smoother and plumper than before. People around me have even noticed the difference. This is a wonderful product for anyone who has combination/dry skin. Depress the dropper slowly while the bottle is closed. This prevents any air entering the pipette and ensures the optimal amount of product is dispensed. Depress 2-3 drops onto fingertips and pat gently over the face & neck. The Body Shop’s Drops of Youth™ Youth Concentrate is a quick-absorbing, non-sticky concentrate, that leaves your skin feeling instantly softer. Taking its technology from plant stem cells from Edelweiss, Sea Holly, and Criste Marine, our Youth Concentrate works to help boost surface skin cell renewal. Skin feels immediately moisturized and instantly softer. I immediately feel the difference in my skin after applying these two products. My skin feels hydrated, smooth, and luminous. You only need a few drops of each product, this will likely last a couple of months. Who knew that The Body Shop had great skin care products. 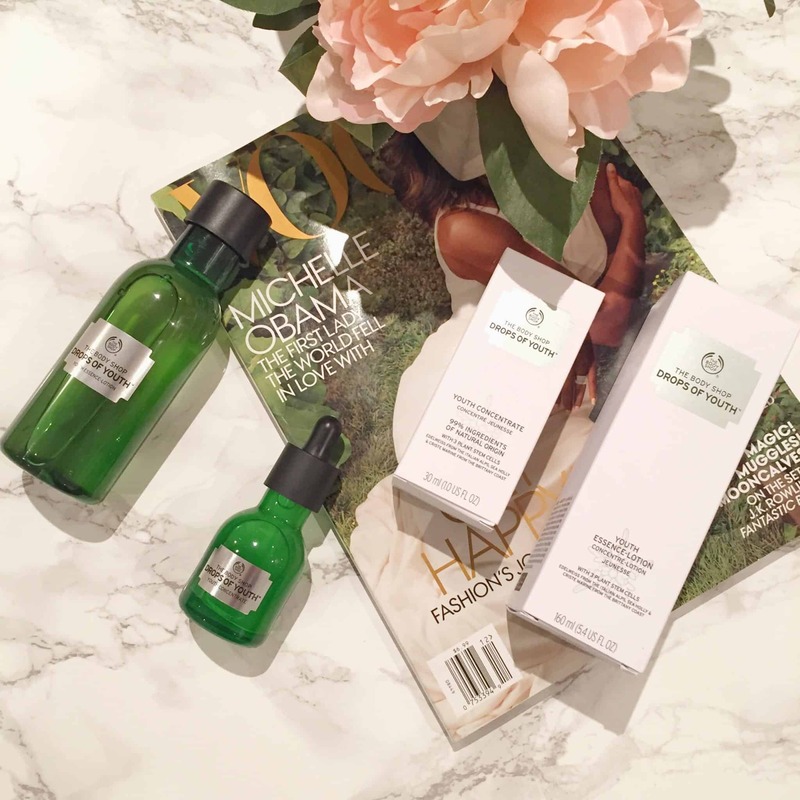 Have you tried any Body Shop products recently? I have never tried these products before. They seem intresting! Just the name of this product sounds so appealing. Who wouldnt wish for their skin to be as youthful as possible. Glad to hear how well it works, it’s always a success when you receive complements over it!